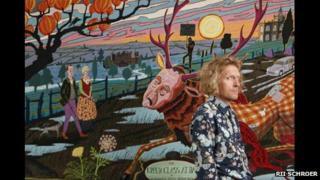 Six tapestries created by artist Grayson Perry have been gifted to the Arts Council Collection and the British Council. The tapestries, titled The Vanity of Small Differences, were made earlier this year alongside Perry's Channel 4 series, All in the Best Possible Taste. Inspired by William Hogarth's A Rake's Progress, they each measure 2m x 4m. The works will begin a national and international exhibitions tour, starting in Sunderland in June. The tapestries tell the story of class mobility and the influence British social classes have on aesthetic taste, charting the "class journey" made by the protagonist in Perry's series, Tim Rakewell. They include many of the characters and incidents Perry encountered while travelling through Sunderland, Tunbridge Wells and the Cotswolds for the show - which he literally weaved into the work. "I am hugely pleased and proud that The Vanity of Small Differences will be shared by the Arts Council and British Council Collections because this means the work will be able to travel all around the country and the world," Perry said. "Of all the pieces I have made, this was the one I conceived from the outset as a public artwork. "I hope that wherever it goes, it not only delights the eye but also sparks debate about class, taste and British society." With support from the Art Fund, the touring exhibition will begin at the Sunderland Museum and Winter Garden - the town where the first two tapestries, The Adoration of the Cage Fighters and The Agony in the Car Park, are set. It will then continue to Manchester, Birmingham, Liverpool and Leeds. "Grayson's state-of-the-nation tapestries are caustic, funny and affectionate. They are a marvellous gift to our two Collections, and to our worldwide audiences," Andrea Rose, from the British Council, said.